Archille-Claude Debussy was born August 22, 1862 in Saint-Germain-en-Laye. Today, the small Debussy museum is established in the house where the composer came into the world. Claude Debussy, ca. 1908. Photographer Felix Nadar. Photo courtesy Wikicommons. Debussy’s compositions are known throughout the world. His art endures as he is one of the most influential composers of the late 19th and early 20th centuries. Along with Maurice Ravel, he was a notable figure in “Impressionist music”, though Debussy did not like the term applied to his own compositions. He was made Chevalier of the Legion of Honor in 1903. Debussy’s use of non-traditional scales and chromaticism influenced many composers who followed. Debussy’s music is considered sensual and emotionally evocative. The Symbolist artists and writers inspired Debussy’s musical art and cultural foundation. Claude Debussy’s father, Manuel-Achille Debussy, sold china and his mother, Victorine Manoury Debussy, was a seamstress. While Paris suffered the assaults of the Franco-Prussian War in 1870, Debussy’s pregnant mother evacuated to the south, to stay with her husband relatives in Cannes. Debussy began piano lessons there; relatives paid for the lessons. By 1872, Debussy entered the Paris Conservatoire and progressed rapidly. His trajectory to fame and recognition ensued. 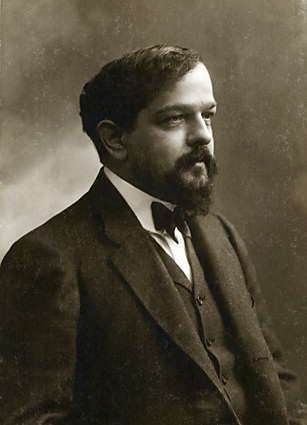 Debussy’s personal life involved numerous alliances and some scandal. In 1904 Debussy pursued an idyllic escape with his new lover Emma Bardac, who was married to a banker and the mother of one of his students. They slipped away to the Isle of Jersey. First to the town of Pourville near Dieppe, then to Jersey, staying at the Grand Hotel. Debussy’s wife Lilly Texier attempted suicide. To avoid ensuing troubles while their respective divorces were being completed, Debussy and Bardac returned to Jersey and also stayed in London. Their daughter was Debussy’s only child. The family lived near the Bois de Boulogne, now 23 Square Avenue Foch in the 16th arrondissement of Paris. Debussy died of longstanding cancer during the bombardment of Paris in the final year of World War I on March 25, 1918, just ten days after the Parisian prodigy composer Lili Boulanger, who in 1913 at age 19 was the first woman to win the Prix de Rome for composition. She was a student of Gabriel Faure and influenced by Debussy, who had himself won the Prix de Rome in 1884. Claude Debussy, his wife and daughter are buried in Passy Cemetery near the Trocadero. In 2012, Smith College Museum of Art in Northampton, Massachusetts offered the exhibition Debussy’s Paris: Art, Music and Sounds of the City. Also in 2012, the Musée d’Orsay in Paris produced the exhibition Debussy, Music and the Arts.